To provide high quality educational programs that address the needs of local farmers, horticulturists, foresters and homeowners in Herkimer County. Increase the competitiveness and profitability of commercial agricultural enterprises. Encourage effective marketing strategies for agricultural products. Provide clientele with the most recent information possible relating to their area of interest. Promote the adoption of environmentally sound practices by producers and consumers alike. The agricultural program of CCE Herkimer County is comprised of two main tracts. The first of these deals specifically with local issues which include consumer agriculture and horticulture, small livestock, natural resources and agricultural economic development. Dairy farming remains the mainstay of agricultural production in Herkimer County. According to the 2017 Census of Agriculture, almost $58 million in sales are generated annually. 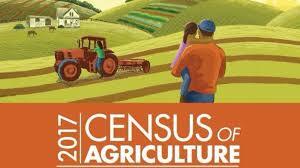 The U.S. Department of Agriculture’s 2017 Census data was released in April. The census is taken every five years. Herkimer County’s data can be found at: https://www.nass.usda.gov/Quick_Stats/CDQT/chapter/2/table/1/state/NY/county/043 The summarized Herkimer County report will be released on May 30, 2019. The Central New York Dairy, Livestock and Field Crops team provides high quality educational programs that address the needs of commercial agricultural producers in Chenango, Fulton, Herkimer, Madison, Montgomery, Saratoga, Schoharie and Otsego counties. The team includes a Dairy Management Specialist, Livestock Specialist, Field Crops Specialist and a Farm Business Management Specialist. Educational activities provided by the Team to the agricultural community emphasize not only technical subject matter but also resource management and problem solving. Achieving profitability while meeting personal and business goals is stressed. Governor Andrew Cuomo launched NYS Grown & Certified in 2016 to help meet the growing consumer demand for local foods grown or produced to a higher standard. The program certifies New York State producers who adhere to high food safety and environmental stewardship standards. The NYS Grown & Certified Program was designed to strengthen consumer confidence in New York products and assist farmers so they can take advantage of the growing market demand for locally grown foods that are produced to a higher standard. Certified producers are able to use a special New York State seal that indicates the producer adheres to higher standards of food safety and environmental stewardship. It is supported by a marketing campaign including on-product labels, promotional materials, such as the NYS Grown & Certified website, and sales materials, to educate retail and wholesale buyers on the value of the program. For more information on NYS Grown & Certified, visit certified.ny.gov, or follow the program on Facebook, Twitter and Instagram. NY State Dept of Ag and Markets has awarded a $500,000 grant to implement the program in the Mohawk Valley Region. CCE Oneida County was chosen as the administrator of these funds for the following six counties: Fulton/Montgomery, Herkimer, Otsego/Schoharie and Oneida to help Mohawk Valley producers meet the food safety standards necessary for participation in the certification program. The program is open to agricultural producers who want to become certified in the NYS Grown & Certified Program. Eligible commodities are dairy, eggs, beef, poultry, pork, shellfish, Christmas trees, maple, cut flowers, craft beverage ingredients, wine, spirits, beer and cider. Applicants are required to contribute 10 percent of the total project cost in the form of cash equity. Eligible producers can apply for grant funding of up to $50,000. Cornell Cooperative Extension offices throughout the six-county Mohawk Valley Region in the New York State Grown & Certified Agricultural Producers Grant Program will provide technical assistance to producers, including assistance with Good Agricultural Practices (GAPs). Soil and Water Conservation offices in the six counties will assist grant recipients with Agriculture Environmental Management (AEM). The program is a joint effort of the College of Agriculture and Life Sciences and Cornell Cooperative Extension. 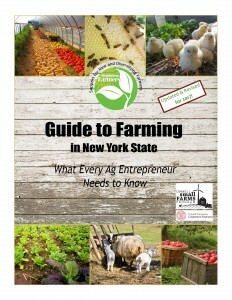 Guide to Farming in New York State: This Guide is updated annually to provide answers to questions about taxes, business planning, labor law, zoning, regulations, marketing and many other topics that farmers need to know.